Dage the Evil’s month of amazing birthday gear continues! * The Arcane Dark Caster class was designed by the powers of Arklen, Pisces, and Boxer502 combined, but the entire class team contributed to bring you what looks like a pretty dark and deadly new class! Read on to get a look at what you can get! 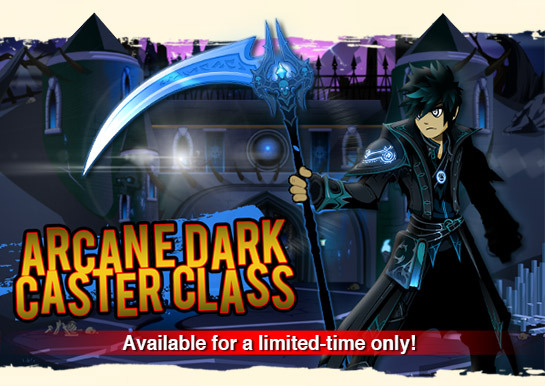 Unlock the Arcane Dark Caster Class for 2000 AdventureCoins in the Class shop and find it in the March Rares Shop! If you get the Class or already have the armor, GOOD NEWS! 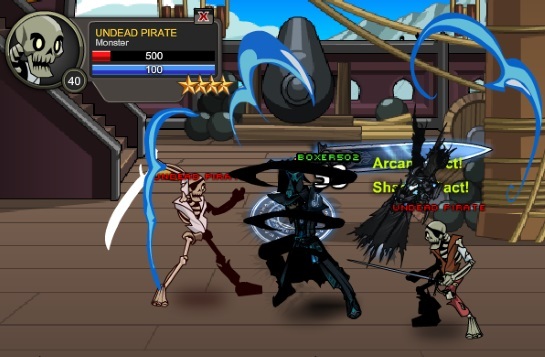 That's GREAT news for those of you who bought the Arcane Dark Caster or Shadowed Gunner armors for 2000 AdventureCoins: YOU unlock the Class for FREE! If you created the Shadowcraft Dark Gunner armor by purchasing the Arcane Dark Caster armor for 2000 ACs, you can unlock the Arcane Dark Caster Class for free, TOO! Talk to Dage's little arcane minion in Battleon to quest for Arcane Tokens to unlock the Arcane Dark Caster Class or Armor from the merge shop! Note 2: Each of the above armors and the Class will be unsellable until April 6th. Dage has come around to gifting you with his set of shadow skills in the Arcane Dark Arts and you have become one of his legion's elite casters... an Arcane Dark Caster. Stats: Arcane Dark Casters favor Intellect and Wisdom. ManaRegen: Arcane Dark Casters gain mana from all hits landed in combat, and especially on crits. The amount depends on damage relative to *their own* HP total. You gather the darkness within and unleash it in a quick flurry of black arcane energy. Applies Consumed by Shadows which deals damage over time, stacking up to 100 times and lasting 10 seconds. The duration is refreshed when restacked. Yes, this DoT can stack to 100 and yes, with enough foresight and preparation, it’s possible. How high can you go? You leach at the darkness within your foe, absorbing a steady amount of health over the course of 15 seconds. The darkness blinds them as well, reducing chance to hit by 15%. Can't miss. Damage: 80% DoT and HoT life drain. This is your main defensive tool. Use it right before casting Arcane Overwhelming and watch both your mana and health quickly replenish. Both the HoT and the DoT get buffed by Shadow Pact from your Arcane Shadow Minion. Concentrate your shadow magic and summon an Arcane Shadow Minion to buff your dark magic and defend you. Increases all magic damage and magic healing and reduces all damage taken. The pacts last for 10 seconds and can be stacked up to 5 times. Your minion is only visible if summoned out of combat and when you don't already have a pet. Otherwise, they're still there, just not visible! A stackable buff that increases damage and defenses. It lasts only a few seconds longer than Arcane Overwhelming’s stun. Unless you’re really careful, you have to chose between keeping these stacks high or keeping Consumed by Shadows stack’s high. For a more defensive approach, the pacts will keep you alive at the cost of damage. You focus intently, completely enveloping yourself in arcane energy and rapidly regenerating mana for 6 seconds. You are stunned for the duration. You also gain Arcane Unleashed, reducing all mana costs by 50% and increasing DoT damage and haste by 30% for 20 seconds. You’re stunned, for 6 seconds! Why would we do that? Well first off, you’re a DoT class so most of your damage will be ticking away while you’re stunned and we wanted a way to give you a mega buff. With proper practice, you should be able to keep both your pacts and Consumed by Shadows up after the stun duration. * And don’t miss the rest of Dage’s dark birthday gear from his shop in Battleon! ** Arklen is our monster animator and one of our regular map coders. He's now branching out into class design as he continues his quest to do ALL THE THINGS! Pisces is one of our intrepid class designers, and played a big role in the technical and balance arenas. Tophats off to Boxer, who had a big hand in the flavor of the design. Mystical Dark Caster Class is IDENTICAL to Arcane Dark Caster, just has a different name. *** Just like we have been adding in armor versions of other, older classes, buying the Arcane Dark Caster Class will unlock its armor version! **** If you're a fan of the Full Metal Alchemist, this is what we call equivalent exchange.